Wedding invitation addressing etiquette is a guide for you when you are getting ready to send out your invitations. Depending on the size of your guest list, you will want to give yourself a good head start addressing them. Good wedding etiquette has you sending out your invitations 8 weeks prior to the wedding. If this is the case, it is a good idea to have your invitations printed and ready to address at least three months before the big day. 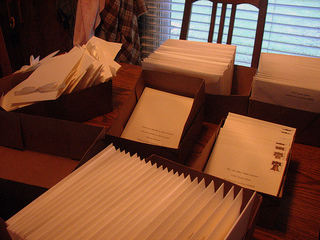 Wedding invitation etiquette states that each envelope is addressed by hand. Although printed labels would be much easier, you will show good envelope etiquette by taking the opportunity to wear your hand out. A fabulous idea in this arena is to have an invitation addressing and assembling party with your bridesmaids and groomsmen. This is a great way to put them to work. Wedding invitations are usually sent in two envelopes. The outer envelope is addressed formally to the guests, while the inner envelope will include other guests from the same address. Good wedding invitation addressing etiquette is shown when you use formal titles on your outer envelope. Gone are the days of Mr. & Mrs. Johnson addressing. It is so important for you to recognize each person with their proper titles. The following is a list of examples of how to address the outer envelope and what to include on the inner envelope. Taking the time to address your invitations will give you the opportunity to think about whom you are inviting and why they are so special to you. They will be honored that you included them in your special day (and hopefully they will use their good wedding rsvp etiquette). Good wedding invitation addressing etiquette will take some time and effort, but it will be well worth it to you and your guests.